What if you could extend the power of your business (or “branding”) cards? At Not Just A Copy Shop, we have several variations on the business card that can be just the thing for your branding and marketing efforts! 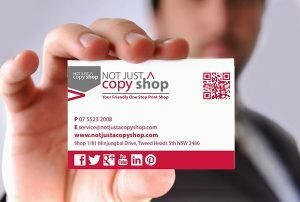 But business cards are so taken for granted that sometimes we don’t think of that little 2″x3.5″ rectangle of paper containing our name and contact info as what it is: a brilliant opportunity to market yourself or your business to a completely targeted and captive audience – the people to whom you hand those cards. In this post NJACS is going to talk about your traditional business cards and suggest four new ways to use “business” cards in your marketing and branding: Marketing Cards; 2xDL Marketing Cards; Membership Cards, and; Appointment Cards.